Leaves, twigs and the inflorescences all hang down around the main trunk of this medium-sized tree in the myrtle family. With dark red spikes of flowers this has attracted the attention of landscape gardeners in tropical and subtropical regions worldwide. It is originally from Queensland, Australia. Copious nectar in the flowers attracts many kinds of birds. At left a Common Bulbul hangs from twigs to get at the nectaries. However, because this plant is not native to Kenya few if any insects will be found eating the leaves or developing within the fruit. 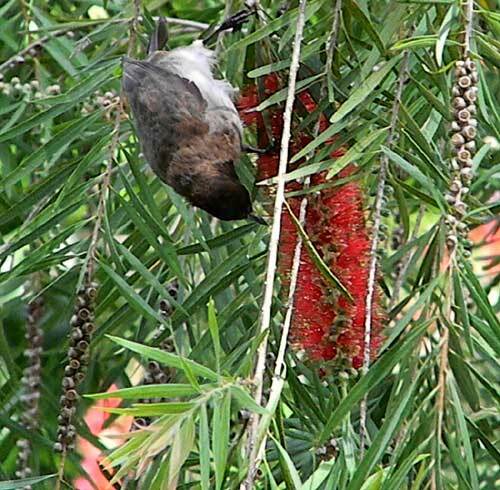 Gardeners might appreciate this fact, but nature lovers should not, because it means these trees do not contribute to the food webs vital to the survival of birds, reptiles and other components to Kenya's unique biodiversity.